The DSE7570 Sync Lock Controller has been designed for manual connection and disconnection from the mains/utility supply.The Sync Lock Controller provides a user-friendly zero-sync/phase locking solution, that is easily integrated with generators controlled by the DSE7510 Load Share modules. With forward and backward syncronising with the mains/utility supply, the DSE7570 is ideal for temporary generator installations. 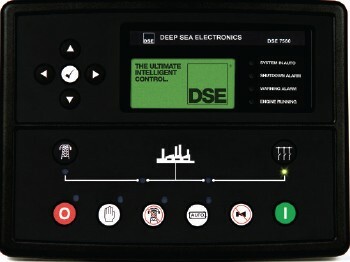 Where access is restricted, the DSE Sync Lock Interface is used to provide up to a maximum distance of 200 m between the DSE7570 Sync Lock Controller and the DSE7510 Load Share module. It achieves this by providing an MSC link input for the DSE55XX and DSE75XX modules and another for the DSE8XXX series. This reduces the MSC link functionality of a system to that containing only DSE55XX and DSE75XX modules. The DSE125 MSC Converter module is used to interface an MSC link containing DSE55XX and DSE75XX modules with an MSC link containing DSE8XXX series modules. 3 red LEDs provide indication of the module’s operational status. CANBUS扩展器 The DSE124 is a CANbus extender capable of extending either the Multiset Comms (MSC) Load Share Link or engine CANbus. speed or number of modules that can be accommodated. Without the fibre optic port. This version is used for applications where only the copper cable is required. A maximum of 8 copper 250m segments and 2 fibre optic 2000m segments can be used together. Both modules have been designed for DIN rail mounting or for fitting directly to the chassis. DSE8680母排断路器控制器：该款控制器设计用于控制母排断路器。通过DSE的多台通讯连接线（MSC），该控制器会在母排断路器分合闸时自动管理和检查同步。它与 DSE8610 和 DSE8710 同时工作，可支持多达32台发电机。The DSE8680 module is designed to control a bus-tie breaker, manage the synchronising and check-sync across the breaker and automatically control the DSE MSC (multi-set communications) link when opening or closing the bus-tie breaker. The DSE8680 module has been designed to work with DSE8610 and DSE8710 Load Share control modules which support up to 32 generators.